Warner Home Video has announced their next Peanuts DVD, titled Happiness is... Peanuts: Team Snoopy. The DVD will be released on May 8, 2012, and will feature two half-hour shows: the 2003 special Lucy Must Be Traded, Charlie Brown and "Snoopy's Brother Spike," episode #15 of The Charlie Brown and Snoopy Show from 1985. 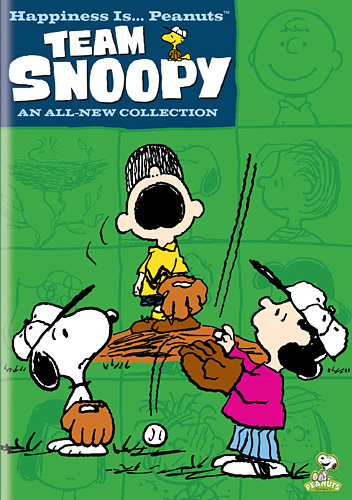 In Lucy Must Be Traded, Charlie Brown, Charlie Brown trades Lucy to Peppermint Patty's baseball team in hopes of getting a better player and winning some baseball games. Lucy Must Be Traded was released on DVD by Paramount, but that DVD has been out of print for several years. "The Pelicans" - Peppermint Patty makes Charlie Brown dress up in a pelican costume to be her baseball team's mascot. "Great Pumpkin" - Peppermint Patty and Charlie Brown compete in a bowling tournament while Linus and Sally wait for the Great Pumpkin in a nearby pumpkin patch. "Spike" - Lucy attempts to fatten up Snoopy's skinny brother Spike in preparation for a fight with the Cat Next Door. This will be the first U.S. DVD release of "Snoopy's Brother Spike." There are no special features on the DVD. Happiness is... Peanuts: Team Snoopy will have a suggested retail price of $14.97. Nice. I watched the Great Pumpkin short on You Tube a couple years back. I always thought that would have been an appropriate extra on the official Great Pumpkin dvd release. I guess I'm the only one lol?